WASHINGTON (CN) – In a 14-year-old lawsuit over defective bulletproof vests, a federal judge urged one of the last defendants standing Wednesday to lay down his armor and settle with the government. 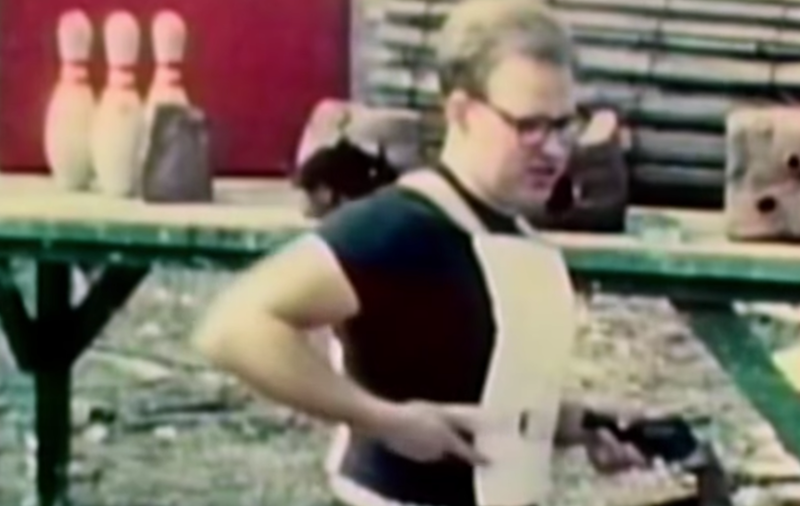 Taken from a 1975 promotional video, this image shows Richard Davis preparing to shoot himself with a pistol to demonstrate the success of his soft-armor bulletproof vest. U.S. District Judge Paul Friedman made the appeal this afternoon, about three hours into a pretrial conference where prosecutors haggled over witnesses and exhibits with Richard Davis, the founder of Second Chance Body Armor Inc.
“I don’t understand why you don’t settle this case,” Friedman told the former Detroit pizzeria owner, who is representing himself pro se. Back in 1969, Davis conceived of his idea for a soft-armor bulletproof vest after a pizza delivery gone awry. He exchanged fire with armed robbers and was hit twice, which inspired him to invent a cloth vest that would protect police officers. Davis built the company from the ground up, demonstrating the effectiveness of his invention by filming videos in which he shot himself while wearing one of his vests. If he settles, Judge Friedman urged Wednesday, Davis has a chance to emerge from the lengthy litigation with his reputation intact, facing no obligation to admit liability for any wrongdoing. “The likelihood that you’re going to win at trial is not great,” Friedman said. Friedman also indicated that he understood Davis wanted to go to trial out of principle. “What you tried to do is worthy of great respect,” Friedman said. Much of the evidence Davis wants to present at trial pertains to the history of the company, including a catalog that documents the lives his vests saved over the past 30 years. Friedman said much of it constitutes inadmissible hearsay, however, and that Davis should be concerned about what an adverse judgment against him might look like. “There will be 20 to 30 pages of fact-finding that you’re not going to like if you lose,” Friedman said. Second Chance Body Armor was one of several that the government sued in 2004 after doling out millions for defective bulletproof vests made with a fiber called Zylon that had been produced by Toyobo Co. Ltd.
To date the government has recovered $132 million in settlements. In a statement this past March announcing a $66 million settlement with the Japanese-based Toyobo, the government identified Davis and Honeywell as the lone holdouts. Another 16 entities that were involved in the sale, manufacture or distribution of Zylon vests settled previously for $66 million as well. Davis blasted the case at Wednesday’s hearing as a “cash cow” for the government, saying he would rather see any money he loses as a result of the case to reach people who sustained injuries while wearing the vest, not the government. Prosecutors summed up their case in a May 10 brief, saying Davis knew that his vests degraded within two years, but failed to warn users or take corrective steps to redesign the vests with more ballistic layers. Davis also allegedly knew the defect rendered the vests unsuitable for law-enforcement officers to use, but mused that the company could wait and do nothing until a police officer was killed or injured. Friedman’s call for a settlement did not appear to the hit the mark Wednesday. After standing quietly at the podium until it was his turn to speak, Davis invited the judge to look critically at the government as well. “I think they would argue, Mr. Davis, that it’s a matter of principle for them, too,” Friedman responded, noting that the government has invested 14 years in the case. After an hour-long lunch break, Davis said he had considered Friedman’s plea. “I don’t know if it’s going to work,” Davis said. He indicated he would continue talks about a settlement, but said he was still planning to move forward with the trial, which is slated to begin on June 18.